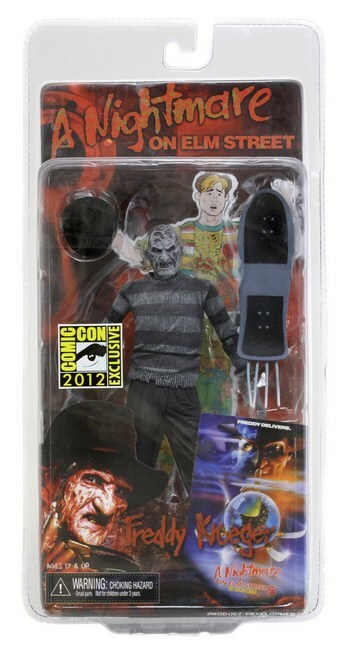 This SDCC Freddy Comes with Skateboard and Mark Gray! You are here: NECAOnline.com » Licenses » Movies » Nightmare on Elm Street » 2012 SDCC Exclusives Pt. 4: B&W Comic Book Freddy as seen in The Dream Child! 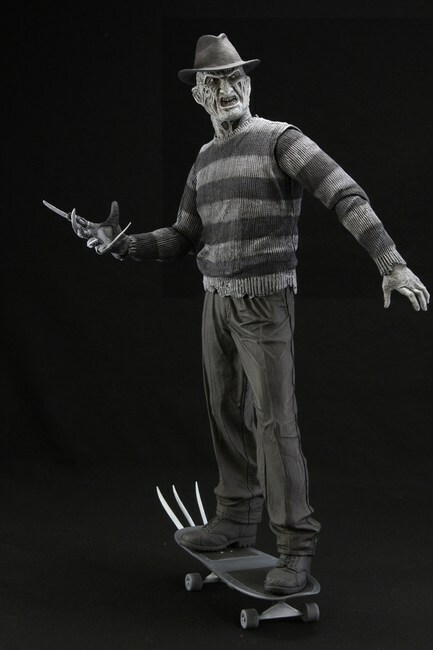 There’s never been a better argument in favor of insomnia than A Nightmare on Elm Street, and for the latest in our series of San Diego Comic Con exclusive items, we’ve got the Gloved One himself, Freddy Krueger, as he appeared in the fifth installment of the franchise, The Dream Child. The movie, which came out in 1989, has a cult within the cult of the larger series, and — what really matters — it features some of Freddy’s best kills ever. Best of all might be Mark Gray. A comic book geek before it was cool to be a comic book geek, Mark fantasized about getting the girl, being the hero, etc. So what did Freddy do? Well, Freddy sucked him into a comic book world, to live out his worst nightmare, of course! He is the dream master, after all. Mark — brave and hopeless soul that he was — fought back by turning himself into his own superhero, The Phantom Prowler, and blowing Freddy to tiny little bits. *Spoiler alert*: It didn’t work, Freddy came back to life, turned Mark into paper and sliced him to shreds with his always-terrifying glove. 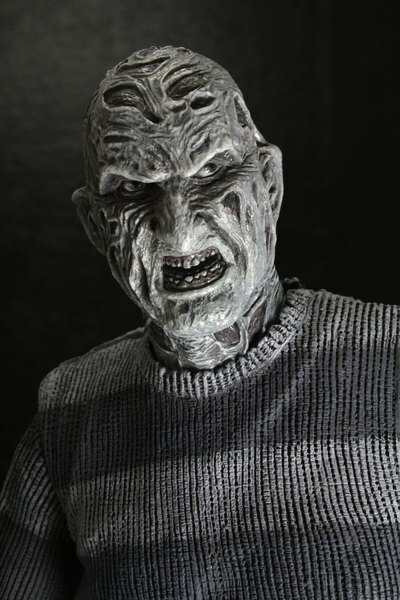 But, to honor Mark’s efforts and to honor the series as we always do, we’ve included an actual foldable, sliceable paper recreation of Mark Gray with this grayscale 7″ Freddy action figure, which captures the look of that death scene and the comic book world. What could be more perfect for SDCC than a superhero-destroying Freddy Krueger? Well, we don’t really know. That’s kind of why we made it. 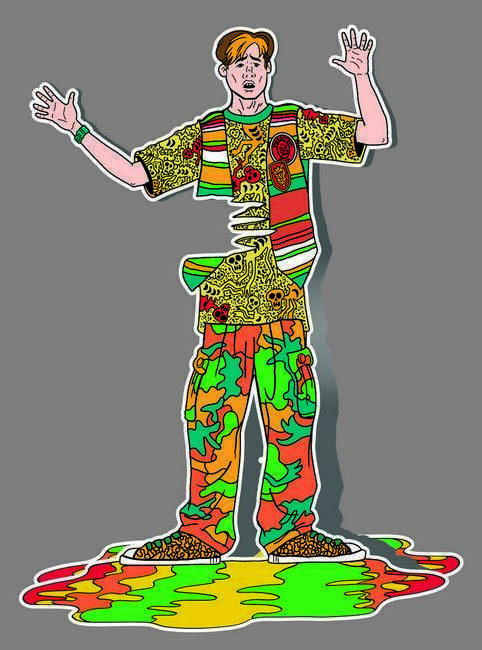 Con-Exclusive B&W Comic Book Freddy also comes with a skateboard and his trademark hat, which he just wouldn’t be Freddy without. Be sure to check out our other A Nightmare on Elm Street items, and stay tuned next week for not one, but TWO super-secret Comic Con exclusives and a special announcement that we think is really going to open things up. As always, you know where to go for news and updates on all your favorite games, movies, maniacal monster slasher killers, and much more!